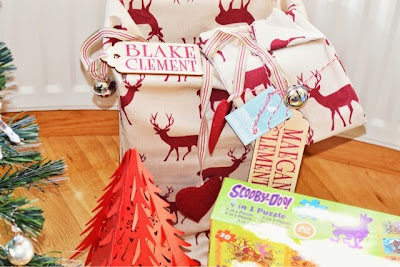 I'm getting really excited about Christmas this year (it'll be the first one in our forever home) and I've been working on my Christmas gift guides since July!!! In an age where digital gaming is rife, it's refreshing to see how much children of all ages enjoy jigsaws - my two have always had them from even before being a year old and I learnt my jigsaw parenting lesson the hard way - make sure you keep them out of reach of children otherwise it can take two small people precisely 3 seconds to empty 14 jigsaw boxes onto the floor - it will take you 3 weeks to sort them all. 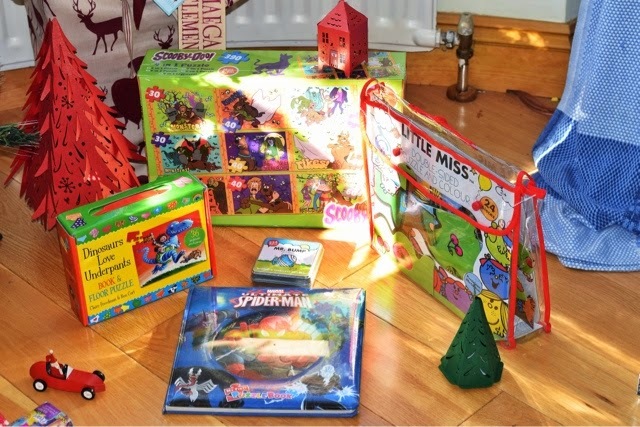 I absolutely love the wonderful jigsaw collection The Eorks currently have - there's a handy stocking size tiny Mr Men jigsaw that comes in a sweet little tin, I've chosen a spiderman jigsaw book which is a very clever concise story book with jigsaw pages to complete - this is also a perfect gift for a little one to give to their best friend. 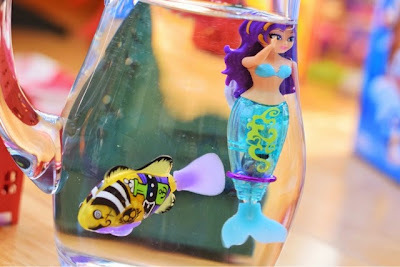 My Magical Mermaid from Zuru is an absolute darling! 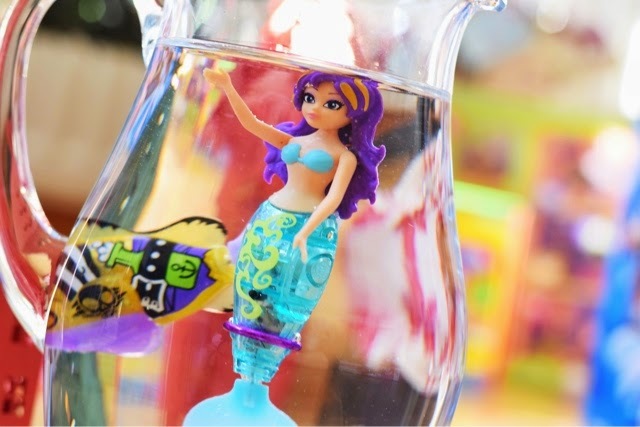 She comes with weight rings, place them on her head and she will swim on her back and place them on her tail and she swims upright, but she's ohh so clever, if you forget to lift her out of the water, she switches off to save her batteries! 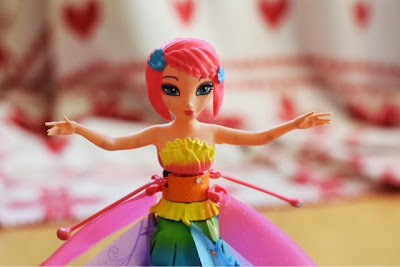 This one is called Pearl and her arms can move, she comes complete with weight rings and spare batteries. Robo fish by Zuru have a special pirate edition, there are 6 brilliant pirate versions of the classic Robo fish available to collect and he looks great swimming around - he's really quick and works the second you place him in water. He comes with spare batteries too and you need to lift him out of the water when you have finished playing to conserve his batteries. 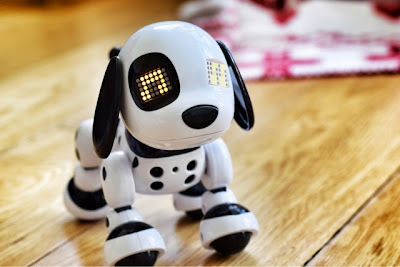 Zoomer Zuppies by Spin Master are adorable interactive puppies - they have sweet little expressions through their LED lights and play lots of games, they have poseable legs and roller ball feet - zuppies move manually so the roller feet makes them very easy to move about and they will interact with their bigger Zoomer dog friends! This little Zuppie is called Spot! 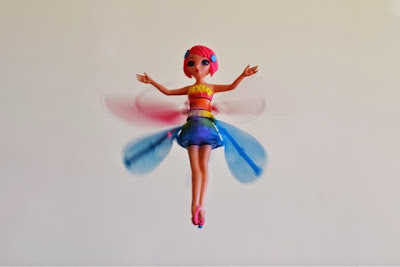 Spin Master's Flutterbye Deluxe Light up Fairy is amazing! She's so much fun! Her charging base will launch her into flying mode from the touch of a button and she will follow your hand as she flies along - she has a strip of lights on one of her skirt panels so you get a beautiful light display as she flies - ohhh how I wish I had one of these back in the 80's and yup! I had a lot of fun playing with this toy - for review purposes of course! 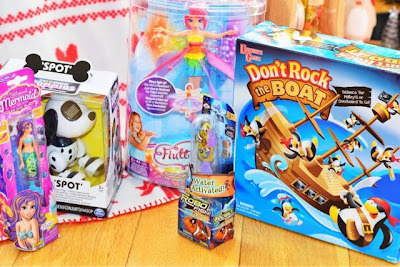 She doesn't come with batteries so make sure you stock up! 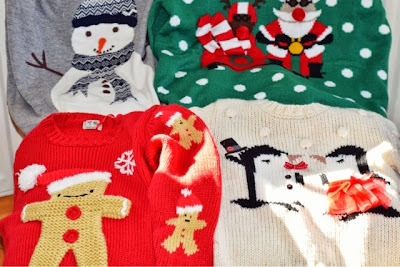 This year, all of us will be having some sort of Christmas jumper day/event to go to and you just can't beat a brilliant Christmas jumper! 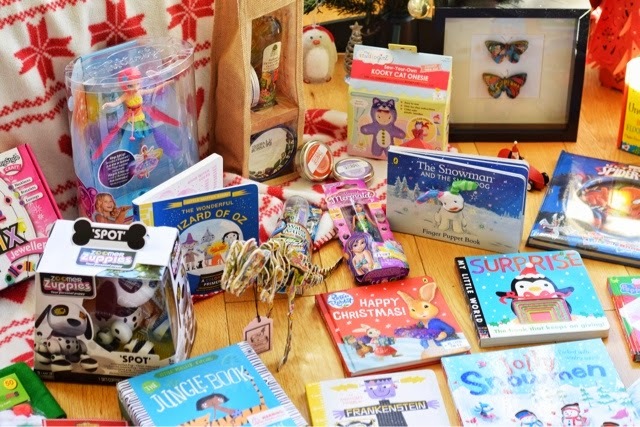 We have one each for the whole family all from Next - and they all come with a super handy gift tag attached! 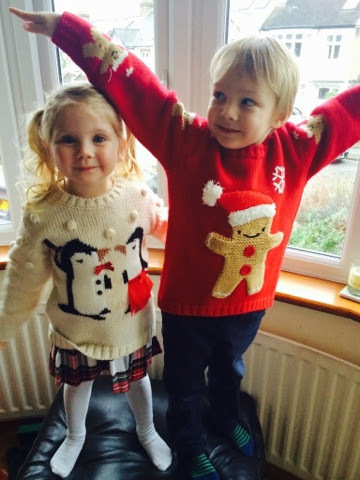 I have a snuggly grey snowman jumper which as sparkly sequin snow flakes, Blake loooooves gingerbread men and I love this gingerbread man jumper complete with lots of arm detail too! Maegan has a darling little penguin couple all cozy and warm with pretty little embellishments and Hubby - well he's into his motorbikes so it had to be Father Christmas on a motorbike - complete with fly away scarf! My Studio Girl do a wonderful collection of crafts and I just love this adorable dolly with cat onesie! You get a ready made dolly and you need to sew her onesie (handy pre punched stitch holes) and attach her hair - she comes with everything you need including a plastic needle. 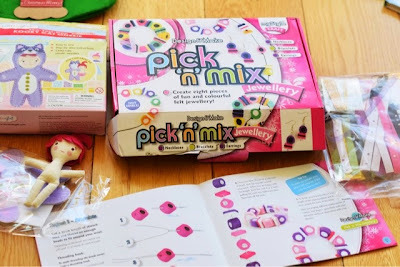 We love the Pick n Mix jewellery making set from Aspace which comes with a 16 page book full of ideas and everything you need from pre cut felt shapes to fasteners and earring finals - suitable for ages 8up - Aspace do amazing childrens furniture and have a lovely gift and stocking fillers area this year. 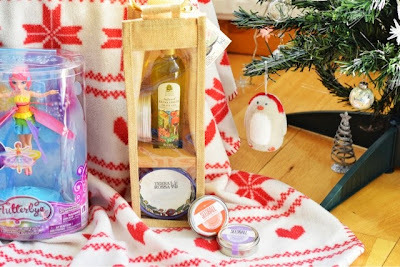 Terra Rossa Dipping Oil set, comes with two beautifully painted bowls, infused luxury extra virgin olive oil and herbs in a hessian bag. With a story steeped in history, this is perfect for any foodie - a choice of flavours are available. 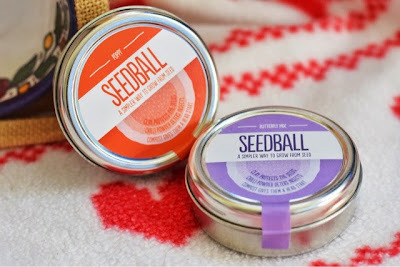 These little gift tins from SeedBall are a great idea and fun way to get some wild flowers in your garden, the tins contain seeds in small clay,compost and chili powder (protection from predators!) balls which you can scatter wherever you'd like some flowers to grow. 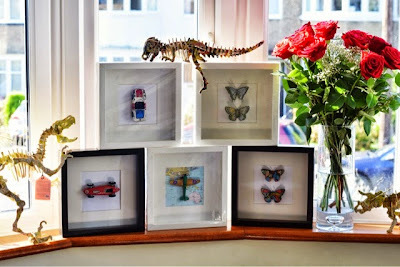 They're a lovely idea and my children enjoyed (very much!) scattering around our garden! Perfect for the young and the old! 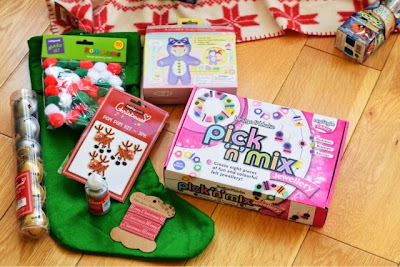 Hobbycraft have everything you need to make your own stocking and I'm looking forward to whipping up a beaut with the help of Blake and Maegan - we've got lots of pom poms and big sleigh bells, glitter glue and ribbon at the ready! and a Pom Pom rudolph kit! 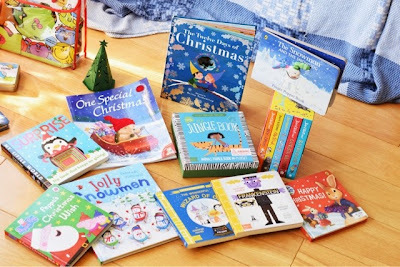 Books for children are always a great gift - I don't think any child could ever have too many books and I like to try and do something different with books - we do an alternative advent calendar where we have a different book each day to unwrap and read to set us in the mood for the festivities! 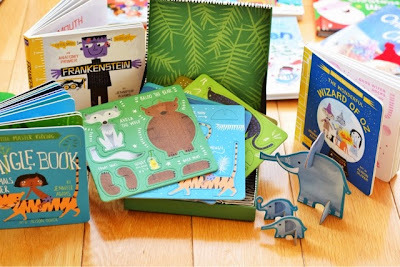 Baby Lit Jungle Book set comes with a lovely animals primer book and all the main characters to build so you can play along too - a very special gift. Baby Lit Frankenstien is a brilliant board book primer introduction to anatomy. 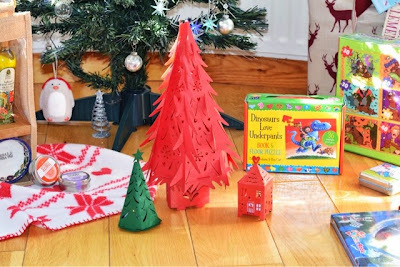 The Hanging Lantern Company have these lovely little decorations which arrive flat so you can build them (all scored and simple to do - literally a case of folding and tucking in flaps), we love the trees and the little houses - My 3 year old is mesmerised by the house, she thinks its perfect for christmas elves and fairies. 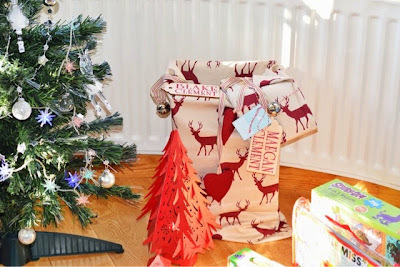 I popped an LED tealight inside mine and they come in a variety of festive colours and sizes, the smaller tree is actually a favour box and the red tree - well theres a 6 Foot tall version at Kew Gardens (Wakehurst Place) how brilliant is that! I can't wait to see these on the table for Christmas Brunch which I'm hosting for about 9 adults and 5 children but probably more! Disclaimer: Some of these items have been sent to me for the sole purpose of reviewing them, some specifically for this post, some I've featured in the past, some items are my very own personal christmas shopping which I just wanted to share, some are loan items which I've returned and some brands have sent me lovely thank you gifts for including them. I haven't received any money for this blog post.